I am excited to be able to reveal a quilt to you today that I made at the end of July. 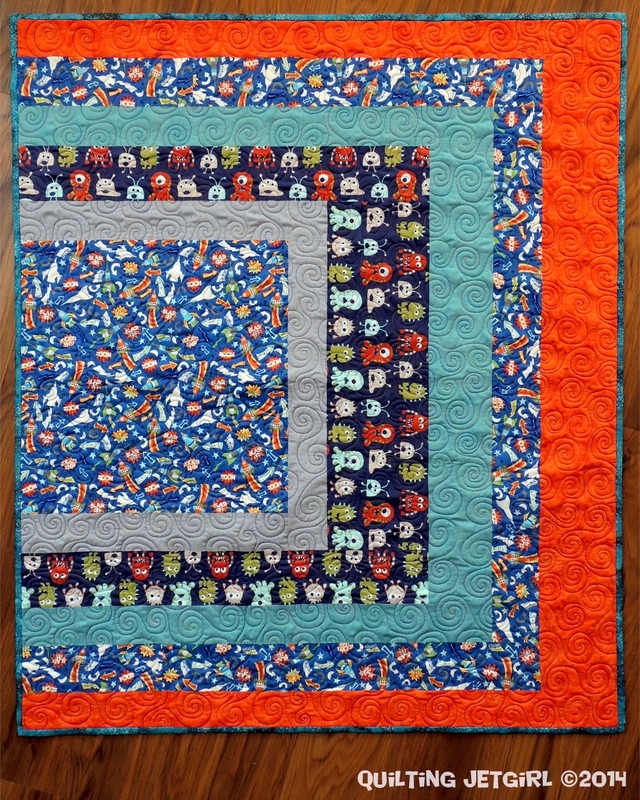 I was approached by a group of friends who wanted to work with me to make a baby quilt as a baby shower gift. We emailed back and forth, and to enhance the experience, we decided to go as a group on a fabric shopping trip. Per the email discussion before the trip, I was planning on working with the ladies to find fabrics to work with a pre-determined design. However, when we were in the fabric store, it was a bit overwhelming for all of us, I believe. In the end, what worked best was for the ladies to find fabrics that they were drawn to and I made a purchase knowing that I could come back to my studio and find inspiration for what to do with the fabric later. The gold flaked teal at the top of the fabric image was selected to be the quilt binding. The inspiration fabrics are the two prints in the middle row, and from those prints, the 3 coordinating solids were chosen. 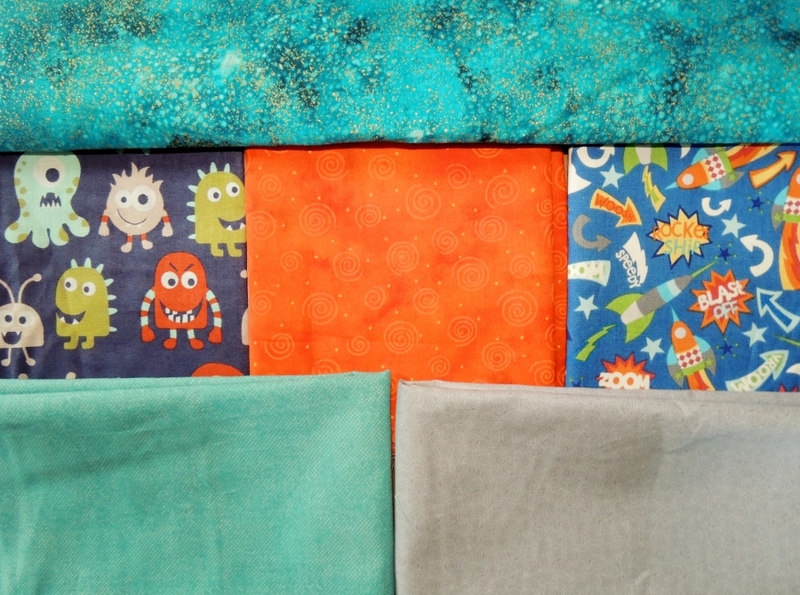 One fun tidbit about the rocket ship fabric on the far right is that the rockets glow in the dark! Using EQ5, I put together 3 design concepts that I thought would make the best use of the fabrics and let the group decide which design they would like me to create. The overwhelming response was to create design Option 1. The quilt top went together very quickly, and in the end I like the orientation of the fabrics better with the block edges on the left hand side of the quilt. I used up the last of the Navy Rocket Age Rocket Blast fabric I had on hand for the quilt backing. 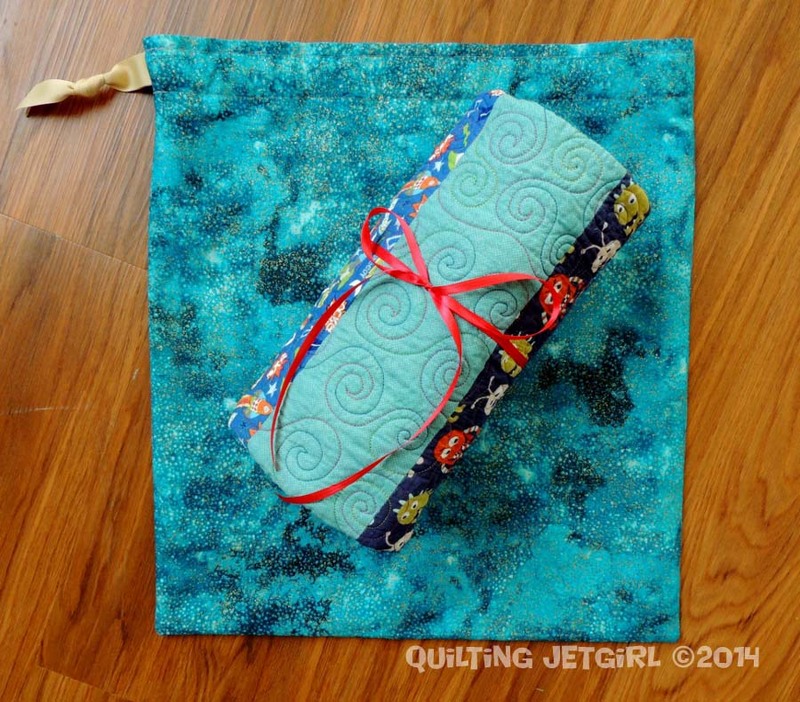 And using my simple drawstring bag tutorial, I made a gift bag for the quilt with the fabric left over from the binding. Total time spent on design, piecing, quilting, and making the gift bag: 10 hours. 3 of the 10 hours were spent on design. If we were able to stay with the original design, I think that the design time would have been 0.5 hours, but the piecing time would have increased and probably balanced out in the end. I’m not surprised you all picked option 1. I would pick that one as well. And look at that orange 🙂 Neat! OH! I’m working with the same line in grey…made placemats and will make a baby quilt too. 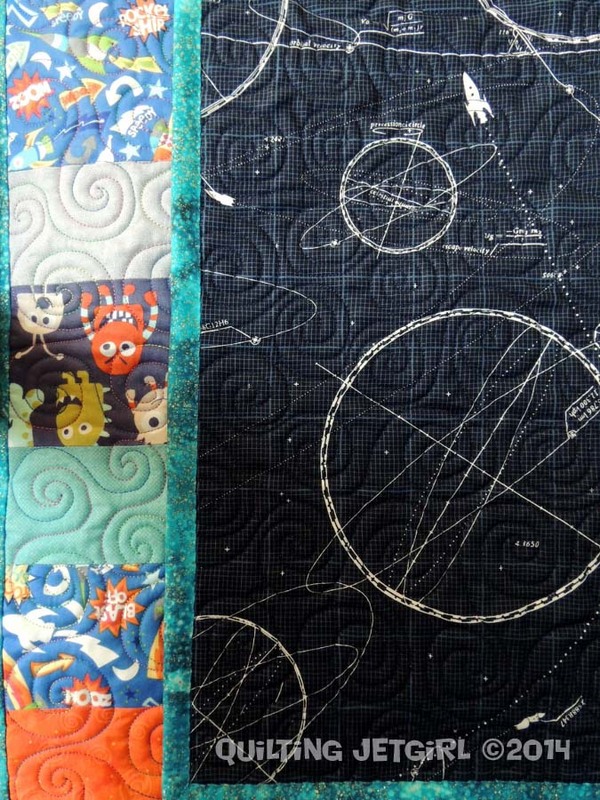 So danged cute, and I love what you did with it…especially the rocketship quilting! Super cute indeed! Im in love with that little monster (?) print! And you whipped it up so quickly. Great job! Yvonne, this turned out beautifully! Nicely done on getting everyone together to decide on the quilt fabrics and design 🙂 The resulting quilt is absolutely adorable! That is super cute, and I love the layout you chose.I like the idea of gifting it in the drawstring bag made from leftovers. I think I’ll try that next time I give someone a quilt! How cute! I love the aliens and the quilted rocket ship. I’ll never get tired of that backing fabric…I must find a way to use some of it in a quilt soon. I am so glad you got to share that with us!! Love the video! You should come on over to TGIFF and join the party @ http://quiltingmod.blogspot.com/2014/08/tgiff.html. You thought of every detail on this, even down to the coordinating bag! I couldn’t resist that rocket blast fabric either. I have a friend who is pregnant with a boy, so I think it won’t be in the stash for too long. The free-motion rocket is brilliant! Love it! What a fun process to shop with them and then give them design options! Definitely super cute! 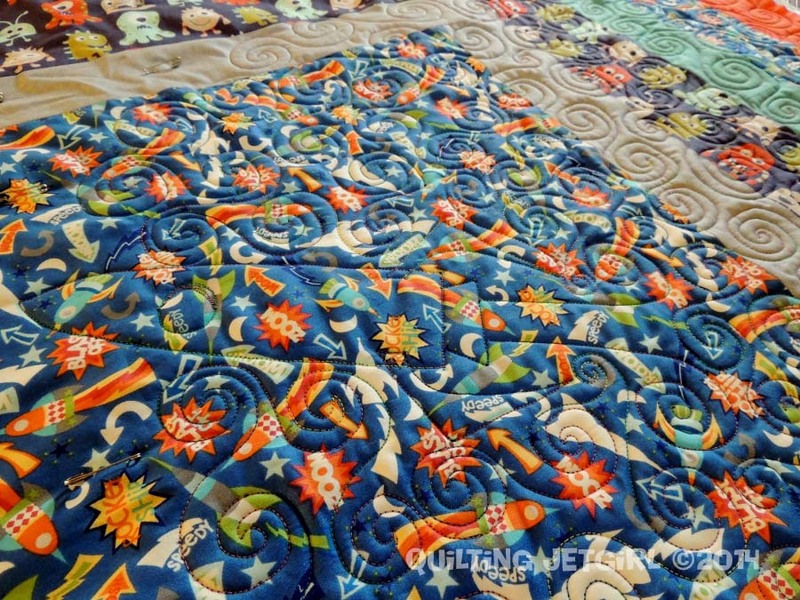 I especially love the rocket design on the quilting, what a great idea. I love the asymmetry of the design. And how cool that the rockets glow in the dark. What a great quilt and I love the bag idea too! I love the modern design! Keeping projects a secret is way more difficult than it should be!! I love that rocket blast backing, and the drawstring bag idea is awesome! What a great thing to do with a gift! You must have been in seventh heaven with more rockets, especially ones that glow in the dark! This absolutely turned out great! I love the odd dimension in it as well and I love your little progress video! This is so cute, and glow in the dark… can’t beat that!